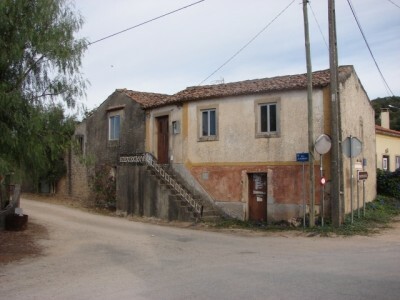 A four bedroom semi-detached cottage in need of renovation work for sale in the popular village of Avecasta, central Portugal. The cottage, which is set over two floors, is connected to both main water and electricity. The cottage has been constructed in stone and has a rendered finish, which does need some repair. The majority of properties surrounding the cottage have been restored or are in the process of restoration. The cottage has aluminium framed windows and metal door. The roof, which has been constructed with wooden timbers and traditional, hand crafted tiles, does need some attention. The main entrance to the cottage is accessed via an concrete staircase to the front. Although the cottage is set over two floors the majority of living accommodation is currently confined to the first floor with a variety of storage rooms to the ground floor, though these could be incorporated to provide additional living area quite easily. The main entrance leads directly into the living room, which has a wooden floor and ceiling. There are traditional stone topped window seats within the living room as well as internal wooden shutters. Off the living room there are two of the four bedrooms, both of which have wooden floor and ceilings. There is an internal wooden staircase within the living room which provides access to the kitchen located on the ground floor. The kitchen is basic and has a large traditional style fireplace to one corner. The floor of the kitchen is concrete and the ceiling is wooden. There is a second living room to the first floor, again with wooden floor and ceiling. There are a further two bedrooms off this second living room, both of which have wooden floors and ceilings. The property’s bathroom is quite basic though functional. There is a toilet, wall mounted vanity basin and shower, though this room also needs work. The bathroom is accessed off a walk through study room which link the two sitting rooms. The ground floor accommodation while accessible from the first floor also has exterior access doors leading to the front of the cottage. In addition to the kitchen there are two storage rooms, both of which have concrete floors, and a large open sided storage area. The property also has a detached garage building, which is situated on the opposite side of the small access road. The garage is detached and has been constructed in stone and has a wooden beamed roof. The garage has a vehicle access door and a personnel door. The garage has been subdivided internally into two large rooms providing plenty of space for a workshop/studio and a spacious garage. The property has 2,190 square metres of land, all of which is flat and walled. The garage is sited on the edge of this land, adjacent to the property’s well. There are several large, mature olive trees as well as walnut trees in situ. The property is situated in a secluded part of the village of Avecasta, close to the church. Although sited on a small access road this is normally quiet and does not receive much traffic. Avecasta has a small mini-market and cafe though there is a larger supermarket approximately two kilometres away in a neighbouring hamlet. The larger town of Ferreira do Zêzere is around 15-20 minutes drive away. Ferreira do Zêzere has a range of restaurants, cafes, supermarkets, banks, schools, health centre, sports centre, library and bus station. The historic town of Tomar, which is home to the UNESCO listed Convento do Cristo, is also around 15-20 minutes drive from the property. Tomar is a popular and bustling town with a good variety of restaurants, cafes, shops, banks, hospital, university, schools and leisure facilities.